Over the past few months we’ve been profiling restaurants that have made bold color choices when it comes to their restaurant chairs. Think the pink barstools at Recess or the red Hugh chairs at Hat Creek Burger. Today, we wanted to switch things up and talk about our favorite summer color, yellow! Nothing says summer like the color yellow. Ranging from a soft shades of buttery yellow to the richest shades of marigold—warmth, vibrancy, and joy are captured by these sumptuous hues. Our factory floors flooded with an endless amount of restaurant chairs bursting with this color. 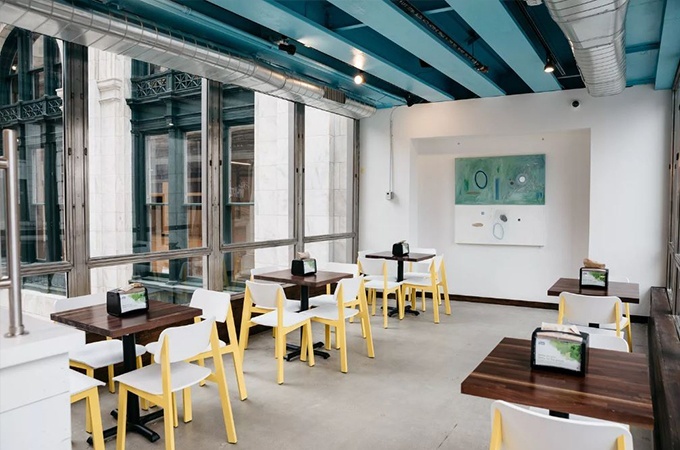 In one of our most recent installations, Brome Modern Eatery, designed by Hallarson Group in Detroit, they used our traffic yellow powder coat on the Sadie II restaurant chair to inject a bit of color into their second floor juice bar. We love this install because the color pops against the concrete city scape to create a bright, airy atmosphere. The use of white on the chair’s seat and back is as unexpected as the blue ceiling. The yellow frames also look great with the richness of the Walnut table tops, bringing out some of the warmer tones in the wood. While yellow and blue together may bring you back to your high school spirit days, they are classic compliments to each other. 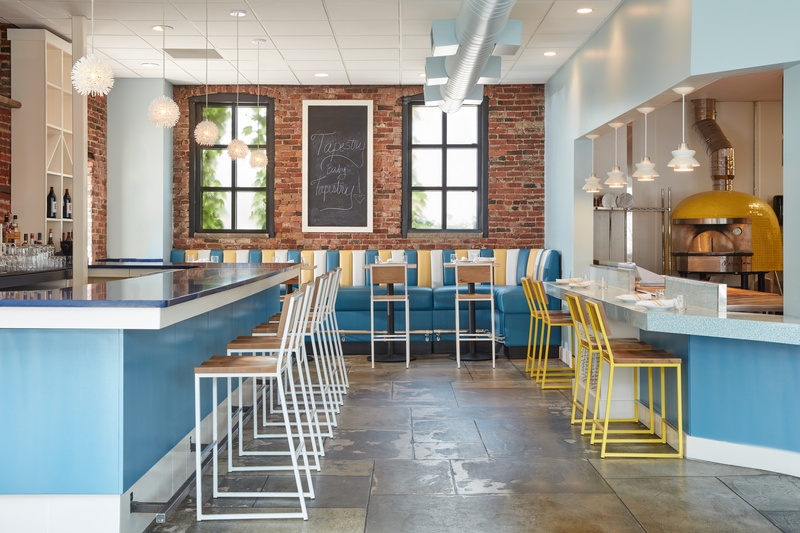 For example, this Boston, beach-inspired restaurant called Tapestry. 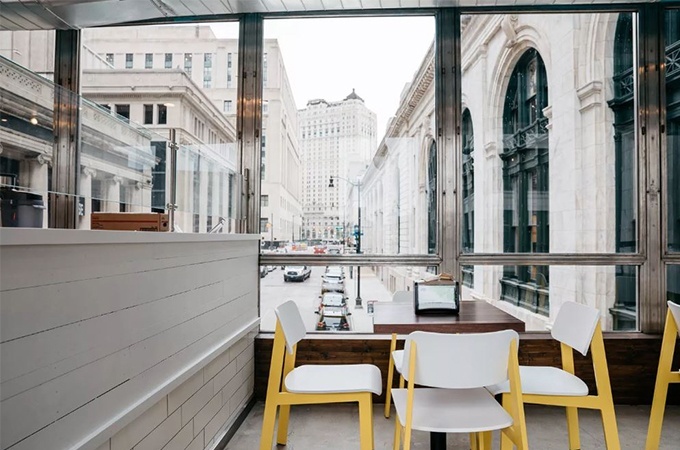 Here, designers used yellow as an accent color, found in the stripes on the banquette and these counter height Brady Barstools (also can we talk about how gorgeous that pizza oven is?). And finally, surrounded by an almost ethereal glow, these Harper A-frame Chairs shine bright inside this unique breakout space. The traffic yellow frames act as a stark contrast to the all black shells of the chair. While the space is minimal, we love how the frame color matches the subtle yellow accent on the light fixtures that brings cohesion to the three spaces without being too obvious. Colorful restaurant chairs have the ability to not only reinforce your brand, but immediately add personality to any space. Honey yellow and traffic yellow are two of our favorite shades and are available as standards on any of our metal table bases or chairs. 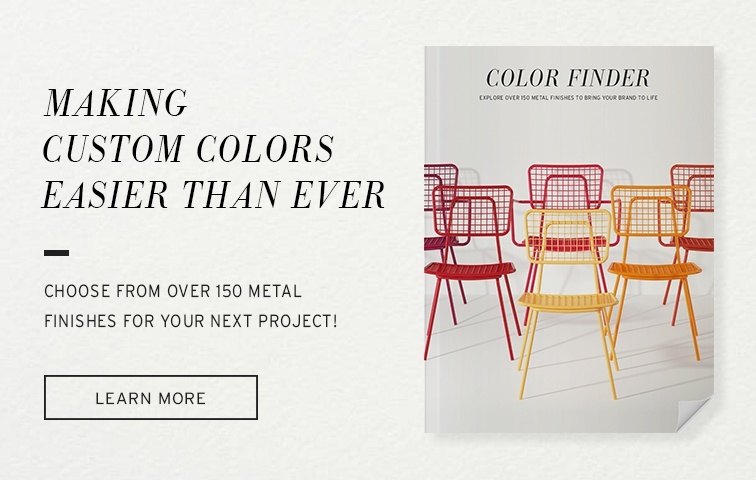 If you’re craving something different, check out our new Color Finder program where you can easily choose between almost 150 different metal finishes.